I'm not sure if this has been mentioned before but I happened to come across it today as I was freeforming* in Storyline. Create a new hotspot freeform slide. Set your correct and incorrect answers - at this point you can only set one correct hotspot, but we will set the rest later, but do go ahead and set all the incorrect ones. Now copy and paste the correct hotspot (the only green one) to other areas of your screen. * That thing you do, when you don't know what to do, but go ahead and do it anyway, instead of getting as far away from the PC as humanly possible. This is cool, and just to be sure I'm understanding, it doesn't allow the Learner to select more than one correct answer, but it allows the developer to place a potentially correct answer in more than one location on the slide. That is, to explain it to myself, I created a freeform Quiz Question with a photo of flowers in a garden. Learner should click on the part of the flower where the seeds are located. In the photo there are two different flowers where Learners could click correctly. So, they can click on either one, but can only submit one answer. Tx for the confirmation, Alex. Hope your w/e is going well. I wonder if anybody knows of a way to set it up so that the learner could select multiple hotspots? Welcome to the community! Glad this thread is still assisting. If you need anything further, let us know! I was just looking for how to do exactly this. It works perfectly. Thank you for sharing! Glad this thread helped you out Monique! This is exactly the answer I was looking for, thanks for offering the suggestion!! These threads just keep on helping :) Thanks for popping in Kelly! Glad you were able to find what you were looking for. So glad I found this, very helpful! Thanks for sharing your wisdom!! Glad this "hack" still works 2+ years (!) later. Still works in 360. Nice trick! 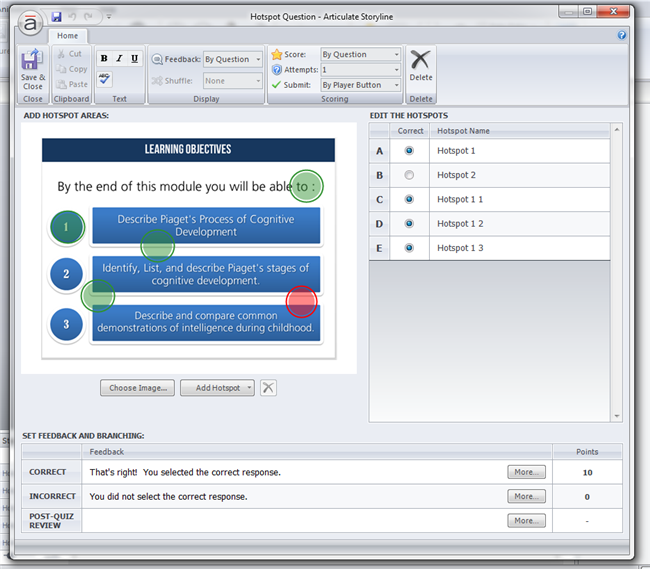 I'd like to set up a slide where the learner has to select two hotspots for a correct answer. Is this possible? Try using Transparent shapes instead of hotspots - so a shape with fill (100% transparent) and use that in the form view as the correct selection - you won't get the little spinning wheel - but it may work for you. Might need to add some sort of 'selected' state to the selected areas so the user knows they've been clicked. Hi Wendy: I used the Pick Many form and it worked perfectly. Thanks for the suggestion! Glad to hear that worked for you Debbie - all the best with your project. You're a genius, this is exactly what I needed. THANKS! "Hi Becca, Rebecca Fleisch Cordeiro said: That is, to explain it t..."
"Hi Debbie Try using Transparent shapes instead of hotspots - so a ..."